Last week, Jan spent at the Natural History Museum in Budapest where a small part of our Cameroonian Lepidoptera material is stored under the watchful eye of Dr. László Ronkay. The museum has an impressive collection of Noctuidae of which our Plusiinae make up a small part. 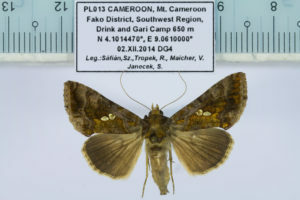 The digitisation and identification of these remaining specimens was one of the last required steps to finalize our dataset of the Lepidopteran traits along the altitudinal gradient.